A couple of months ago I wasn’t really looking forward to the Assembly elections. It appeared as though it was going to be pretty much the same-old, same-old and, with a few tweaks here and there, a ticking-the-box exercise as we counted the winners back into their respective pens. But over the past three weeks it has suddenly become much more interesting. It began when Ruth Patterson confirmed that she would be standing as an independent in South Belfast, with Jamie Bryson as her campaign manager. For nerds and professional commentators this was manna from Heaven. These two are always value for money for journalists, because you can never be entirely sure what they’re going to say or do. And what makes it even more entertaining – and never underestimate the electoral value of entertainment – is that Patterson could win. Indeed, her chances have improved slightly with the unexpected withdrawal of Michael McGimpsey from the field. He was just 19 votes off topping the poll in 1998, but topped it in 2003. In 2007 he plunged to sixth position: and was there again in 2011, although on that occasion he was 812 votes behind Ruth Patterson – who eventually lost out to him on transfers. The pro-Union field could also be crowded, with UUP, DUP, TUV, Ukip, Conservatives, Patterson and maybe even PUP candidates involved in an epic transfer scramble for the second unionist seat. The DUP’s Emma Pengelly is untested in battle and, while likely to win, victory cannot, at this point, be taken for granted. In other words, there’s everything to play for, particularly with the SDLP under a little pressure with their second seat and Alliance hoping to pick up another one. And here are two additional snippets for the real nerds: Alliance, TUV and Ukip are fielding candidates who are former UUP members; and not one MLA elected in 2011 is standing again this time. East Belfast could also be fascinating. It required a unionist pact to remove Naomi Long last May and she’s back in the field this time: although this time there’s no pact, no Peter Robinson to focus the DUP vote, a UUP candidate defending a seat he’s never stood for before and every likelihood that five fractious unionist parties will shred the vote and then refuse to transfer down the line. It’s unlikely that Alliance will pick up a third seat, yet the very fact that it’s not impossible tells you a lot about the state of unionism in what used to be jewel in their electoral crown. For Mike Nesbitt, Colum Eastwood and Arlene Foster this will be their first Assembly election as leader and each has a lot to prove. Martin McGuinness’s calculated and mischievous shift from Mid-Ulster to Eastwood’s Foyle constituency (the jewel in the SDLP’s electoral crown) is intended to spook Eastwood and tie him down there for most of the election campaign. I don’t think the SDLP result will be catastrophic – certainly not as bad as their own internal predictions of a few months ago suggested – but even a couple of losses will be difficult for the new leader. Mike Nesbitt still sounds confident, but the withdrawal of Olive Mercer from the Lagan Valley contest (she claims there were “recent endeavours to hinder my campaign”); the messy and unexpected retirement of Michael McGimpsey (forcing the party to find a last minute replacement); Jeff Dudgeon’s comments about amnesty; and having to co-opt another MLA in Fermanagh/South Tyrone to replace someone who was only co-opted a few months earlier, has taken some of the shine off the early campaign. But the UUP will be unveiling its alternative Programme for Government next Monday, allowing us to gauge the real differences between it and the DUP. Meanwhile, Arlene Foster seems remarkably relaxed about everything. 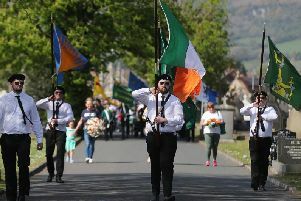 She has to make a number of key decisions in the next few days, not least of which are a final decision on Jim Wells in South Down (he wants to stand and seems to be the only candidate left with his hat in the ring); and whom, if anyone, is to be Emma Pengelly’s running mate in South Belfast (a choice that could decide her fate). I presume she’ll also have to make a call on what happens to Gregory Campbell in East Londonderry – because after May the rules will end his dual mandate; and where, if anywhere, William McCrea will run. The electoral odds remain in her favour, though; but while it’s clear the DUP got ‘a little bit lucky’ in 2011, she needs to make sure it isn’t ‘a little bit unlucky’ in three months time. There’s another reason why this could be an interesting election. A lot of old names have already stepped down since 2011, others will not be seeking re-election and a quarter of the MLAs defending their seats weren’t, in fact, elected to them in 2011. So we’re going to see a generational shift and the emergence of people who will become the key players and household names for the next 20 years or so. Whether that means a shift in thinking and an improvement in inter-party relationships isn’t clear. Ironically, the fact that the next election, in 2021, will see MLA numbers reduced from 108 to 90, could actually have the effect of limiting fresh thinking, if only because fresh thinkers tend to be electorally vulnerable. I’ll be watching the candidates more than the parties this time.